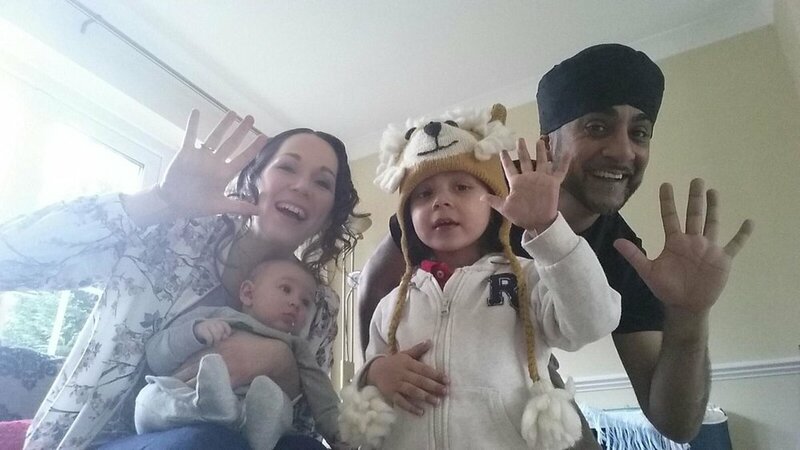 In December 2016, shortly before his third birthday, Reuben Virdee was diagnosed with stage 4 high risk neuroblastoma. As Reuben approaches his fourth birthday, his mum, Jess, shares the family’s experience of the past year in coming to terms with neuroblastoma, Reuben’s treatment and their concerns for the future. When was Reuben diagnosed and what treatment has he undergone? Reuben was diagnosed with stage 4 high risk neuroblastoma on 12th December 2016, just before his third birthday. As with many cases of neuroblastoma it took a while to get the correct diagnosis with Reuben having initially been treated for a viral infection. To date Reuben has undergone induction chemotherapy, surgery to remove the tumour followed by high dose chemotherapy over 15 weeks, a stem cell transplant, a course of radiotherapy. Reuben has just commenced differentiation therapy and immunotherapy. What information did you find useful? When Reuben was diagnosed we were given a copy of the Neuroblastoma UK handbook ‘Information and support for parents’, which I read from cover to cover. It was hard to take in all at once but I’ve very much used it as my ‘go-to guide’ throughout Reuben’s treatment. Our parents also found the grandparents’ version well written and straight forward to understand. How did you cope with the treatment? Early on, Reuben’s Consultant gave us a generic flow chart outlining the 18 months of treatment that lay ahead. Initially you find yourself trying to work out which bit of treatment will be over by when but then we realised that we shouldn’t be wishing away the time and should simply enjoy him as a three year old. The treatment is intensive and involves spending significant time in one hospital or another almost every week. Both the John Radcliffe and Wexham Park hospitals have been marvellous. The first 3 – 4 months were very difficult and it was easy to feel isolated. With only around 100 new cases of neuroblastoma each year, a local hospital in the UK will see fewer than one child with the disease annually. Even the 21 main children’s cancer centres in the UK will, on average, see no more than five cases of neuroblastoma a year. This sense of isolation was helped though by accessing neuroblastoma communities on the internet. It helps you appreciate that you’re not the only family having to cope with neuroblastoma and can offer some useful information and helpful tips. However, the international groups tended to be US-dominated and I realised there was a danger of not comparing like with like as the American set up is very different from our own. I therefore use it as a resource and take what I want from it. What has been the impact on the family? A neuroblastoma diagnosis has a dramatic impact upon family life – initially you find yourself in a total spin with a feeling of no control and overwhelmed by the enormity of it all. Personally, I found I coped better if I took Reuben’s treatment a chunk at a time and focused on helping him achieve the best response at that time, for that particular treatment or procedure. It’s important to celebrate the little wins to keep spirits up over the long haul. You also need to be conscious of the impact of the illness upon other siblings, in our case Hari, Reuben’s younger brother. Initially, Hari would come along when we went for hospital appointments but we limited the time Hari spent in hospital when he became active as he just wanted to crawl everywhere and tamper with the medical equipment! Fortunately, grandparents and friends have been able to help, but it must be an enormous challenge for many parents. Experience of the disease does change you and can make you over-sensitive – if ever I noticed Hari had a bruise I’d think the worst and that maybe he was showing symptoms of neuroblastoma too, not simply the usual bumps and bruises an active 2 year old will incur. We have been fortunate that Reuben is on the SIOPEN trial and that he is eligible to receive immunotherapy. However, access to immunotherapy for other children will depend upon whether the National Institute for Health and Care Excellence approves it for use in the NHS when it concludes its assessment in May 2018. We are therefore now at the stage of worrying about what further treatment will be available for Reuben from the NHS and whether we will need to fundraise for any other treatment he might require. We would like to thank Jess for sharing Reuben’s story and send Reuben our best wishes for a very happy fourth birthday.